If you have questions, problems or just need help with TestComplete, you can either contact our Support Teams or try to search for the needed information using the help resources located on our web site (forums, blogs, technical papers). 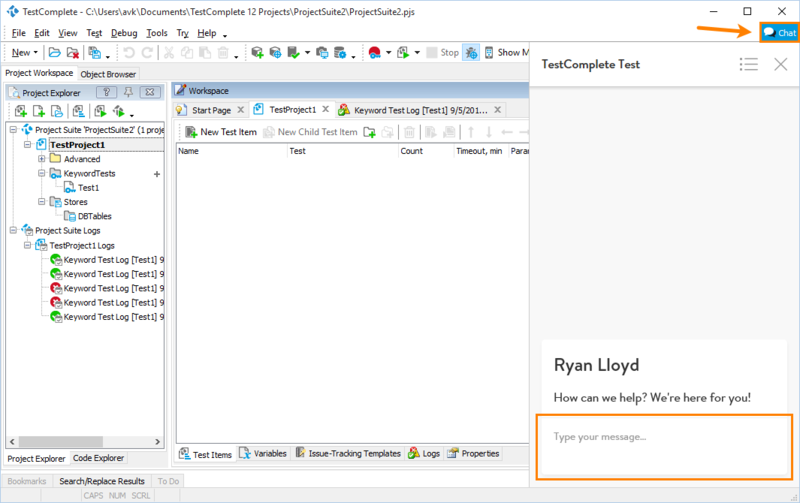 To help trial users have a better experience of using TestComplete and solve common issues, the trial version of TestComplete includes a build-in chat. 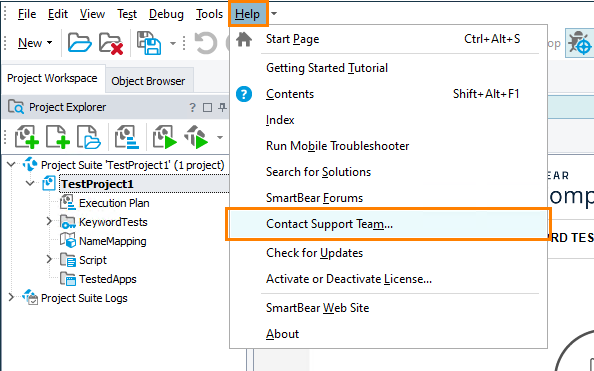 You can use the chat to contact the SmartBear Customer Care team directly from the product. To ask for assistance, click and enter you question. You will get a response from our Customer Care team. In the dialog, to pack your current TestComplete project suite to an archive and attach it to your request, select the Attach an archive containing the project suite to my support request check box. We recommend that you attach your project suite. It can help our Support team solve your problem faster. To collect system information and attach it to your request, select the Attach system information to my support request check box. The system information includes the version of your operating system, the amount of free memory and the total amount of memory, lists of running processes, services and installed programs, user privileges and other system information that may help the Support team resolve your problem. We recommend that you attach this information, because it can help our Support team resolve your problem faster. Fill in the required fields of this form. Note: Your contact information, the product name and version and your Customer ID are specified automatically in the appropriate fields when you proceed to this web page from the Contact Support Team dialog. You only need to describe your problem in the appropriate fields. If your product information and your Customer ID are not specified automatically, you can view them in the email message you received upon purchasing the product or in the About dialog. 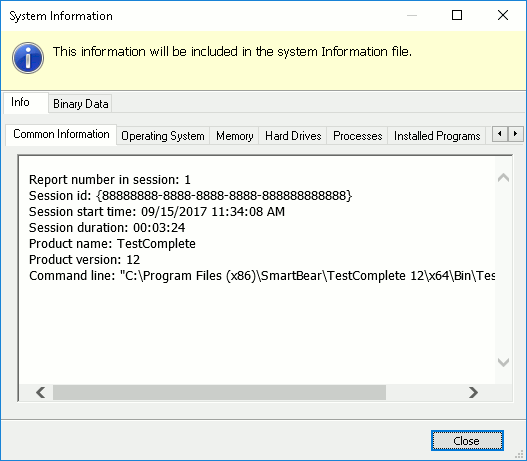 To open the dialog, select Help > About from the TestComplete main menu. The Support team will answer you via email. All further communication will be made via email. However, to start a conversation, please use the Contact Support Team dialog in TestComplete and the Contact Support Form on our web site. For information on our support policies, please visit our web site http://support.smartbear.com/about.